"At 2.47am 24th May, there was huge relief when a signal was received from Suffolk, revealing she had found Bismarck and her consort again. The four big ships were heading on a similar course - the British on 200 degrees, the Germans on 220 degrees, in other words slightly diverging. This was not the best position, but Holland would have hoped the Germans were still not aware enemy capital ships were in hot pursuit and about to catch up with them. (Killing the Bismarck, Iain Ballantyne). "The two squadrons were now approaching each other at a combined speed of almost sixty miles an hour, each side racing through the night to get into the best position for the battle that was now inevitable. For Holland in Hood, that meant presenting the smallest possible target to the Germans until the last moment, then swinging round to bring all eight of his - and Prince of Wales' ten - big guns to bear. For Lutjens, the key aim for Bismarck and Prinz Eugen had to be to sweep the British aside as fast as he could, and continue into the wide spaced of the Atlantic - so tantalising near now - and begin to destroy the convoys." (Hood and Bismarck, Mearns and White). "The Hood, battered and riven by war, was as beautiful as ever as she steamed into her last battle. The sight offered her consorts in the hours left to her cannot have differed greatly from that recalled by the Rev Gordon Taylor from the Destroyer Arrow off Iceland on Easter Sunday, 13th April 1941. 'I took no services that Easter Day, for the sea was too rough and the closest attention had to be paid to the Hood as she made flag signals to her escorts - but I watched her for hours on the Arrow's bridge. As she was only about two cables (or 1200 feet) a beam away from me, she was truly a magnificent sight as she drove along, zig-zagging to foil U-boats, in the green and gold sea whenever the sun came out upon her. I felt unbelievably privileged to be watching her and had already decided the whole experience of seeing the Hood that morning would be completely imperishable and so it has proved to be for sixty years.' " (Battlecruiser Hood, Bruce Taylor incorporating Taylor Remembrance Day sermon). 17th May - THE NELSON TOUCH? To make the most of the forces at his disposal, Admiral Holland hatched a daring plan. If he continued on his current course, he would intercept the Germans during the darkest part of the night. But if he altered course to the North, he could intercept the Bismarck and Prinz Eugen at about 2am, just after sunset in these latitudes in late May. There were two important advantages to this strategy. The Hood would approach the enemy ships almost head-on at high speed and so could quickly close the distance (the combined speed of the two vessels would be roughly 56 knots). This would minimise the amount of time when the enemy's shells would be most dangerous (the closer the range, the flatter the shell's projectory). Equally important, by emerging out of the darkness while the enemy was silhouetted against the still-bright sky to the North-North West, there was the possibility of surprise. The Hood and Prince of Wales would take on the Bismarck while the Norfolk and Suffolk engaged the Prinz Eugen. Even if the Germans were not caught napping, it was a brilliant plan that gave the attackers every possible advantage, but at the price of exposing the onrushing British ships to the full main battery of the Bismarck while only able to return the fire with their forward turrets. But everything depended on the Bismarck's shadowers keeping her on their radar and being able to mirror every changing course and speed. (Bismarck, Robert Ballard). "The first salvo from the Hood fell harmlessly to the stern of the Prinz Eugen, throwing up great geysers of water close to the ship. But Captain Leach aboard Prince of Wales had realised their mistake before Admiral Holland and without awaiting permission, opened fire on the Bismarck. The Hood and Prince of Wales, in close formation, were closing rapidly." (Bismarck, Robert Ballard). "McMullan (Prince of Wales) suspected this was NOT Bismarck he was being ordered to shoot at. He realised that the Hood had made a mistake. A request was made for Hood to repeat her signal, a hint that perhaps the more senior ship had made a mistake. McMullan later expressed sympathy for Hood's mistake in the heat of the action, for the older ship had a lower bridge which meant the silhouette of the left hand German vessel looked bigger than it did to those in the Prince of Wales. McMullan reflected it was 'very cunning on the Germans' part' to have these silhouettes so exactly alike. Of course the Prinz Eugen, although she was a cruiser, was a very big ship." (Killing the Bismarck, Iain Ballantyne). "I could visualise how the mates I knew in other departments would be preparing. Ron Bell was on the flag deck at the other end of the voice-pipe I was manning. His voice did not betray any signs of funk, as I was sure mine did. Near him would be (Frank) Tuxworth, helping to handle the halyards and still joking no doubt. Alongside, in charge of the flags I guess that Yeoman Bill Nevett would be as outwardly calm as ever, despite the pallor of his face. On the boat deck I knew another mate, Petty Officer Stan Boardman, would be readying the crew of (Sammy), the starboard multiple pom-pom. Would he be thinking of his adored wife and his newly born baby, or would he be questioning what on earth he could do with his anti-aircraft guns against the Bismarck's fifteen inches? And what of the sick-bay, where I had spent the first few days of my life in the ship? There the 'tiffies' under Surgeon Commander (Henry) Hurst and sick-bay Petty Officer (George) Stannard would be sterilising operating instruments, laying out blankets, making sure bandages were handy." (Coles and Briggs, Flagship Hood). "Reverend Patrick Stewart broadcast what Briggs remembered as a 'very calm, matter-of-fact running commentary' of events over the tannoy. Further below, in spaces Stewart's voice would never penetrate, Sub-Lt John Cambridge tended the ship's boiler rooms in an inferno of heat and hell of noise. Then there was the 'Chief' himself, Cdr Terence Grogan, performing a miracle of naval engineering from the control platform of the Forward Engine Room. To this miracle the speed of his ship and the efforts of her consort to keep pace bear witness. Vice-Admiral Sir Louis Le Bailly: 'I shall always hope that, just as he died, he became aware that the brand-new HMS Prince of Wales was having difficulty in keeping up with her twenty-year-old flag ship as Grogan drove Hood into her last battle'. (The Battle Cruiser HMS Hood, Bruce Taylor). "Then I was flung off my feet. My ears were ringing as if I had been in the striking-chamber of Big Ben. I picked myself up, thinking I had made a complete fool of myself, but everyone else on the compass platform was also scrambling to his feet. Commander 'Tiny' Gregson walked almost sedately out to the starboard wing of the platform to find out what had happened" Ted Briggs from 'Flagship Hood' Coles and Briggs. "As the Hood turned, X turret roared in approval, but its Y twin stayed silent. And then a blinding flash swept around the outside of the compass platform. Again I found myself being lifted off my feet and dumped head first on the deck. This time, when I got up with the others the scene was different. Everything was cold and unreal. The ship which had been a haven for me for the last two years was suddenly hostile." Ted Briggs quoted in Coles and Briggs, Flagship Hood. After the initial jarring she listed slowly, almost hesitatingly, to starboard. She stopped after about ten degrees, when I heard the helmsman's voice shouting up the voice-pipe to the officers of the watch: "Steering's gone, sir." The reply of "Very good" showed no signs of animation or agitation. Immediately Kerr ordered: "Change over to emergency steering." Although the Hood had angled to starboard, there was still no concern on the compass platform. Holland was back in his chair. He looked aft towards the Prince of Wales and then re-trained his binoculars on the Bismarck. Slowly the Hood righted herself. "Thank heaven for that," I murmured to myself, only to be terrorized by her sudden, horrifying cant to port. On and on she rolled, until she reached an angle of forty-five degrees." Coles and Briggs, Flagship Hood. "Realising the ship was finished, those on the compass platform began to file noiselessly out of the starboard door. Only Holland and Kerr remained, the admiral broken in his chair and beside him his flag captain, struggling to keep his footing as the Hood capsized. Neither made the slightest effort to escape. " 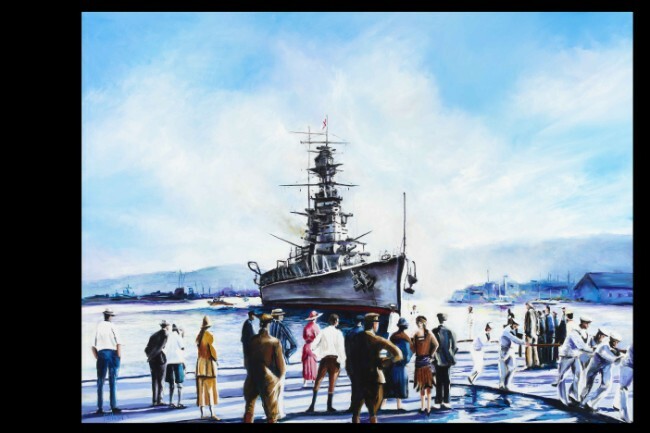 Battle Cruiser Hood- Bruce Taylor. "Ted Briggs, Bob Tilburn and Bill Dundas struggled to stay awake and out of the clutches of fatal hypothermia on their three tiny rafts....They could not, of course, know that the action they had fought had achieved its main objective: to stop Bismarck getting in among the British convoys like a tiger in bloodlust. Nor could they know that their fight had marked Bismarck down to die- an end that would not be long coming..........Just three men were saved out of more than 1,400- men of many ages, nationalities and ranks, from midshipman to admiral, from long-serving rate to newly arrived ordinary seamen. "With favourable winds", may they all rest in peace" Hood and Bismarck White & Mearns. WHY DID LUTJENS SEND TWO SIGNALS? At this stage, therefore, things did not look good for the British forces and if Bismarck could not be slowed shortly, he would then make it to cover of German forces. It is a well known fact that the Sheffield was mistaken for the BIsmarck by Swordfish crews resulting in her being fired upon with torpedoes. It was extremely fortunate and largely thanks to the skills of her Captain, Charles Larcom, that Sheffield did not sustain a single hit. The mistake was recognised by the Swordfish crews and one signalled to her "Sorry for the kipper!" As things turned out, it was a blessing in disguise as it revealed the inefficiency of the magnetic pistols which were replaced by contact detonators. The next chance would be the last one- there could be no slip ups. Led by Lt. Cdr Tim Coode an attack was made on the BIsmarck- the planes approaching their target from all directions. It was thought at the time that the attack had been unsuccessful.